a photo by Stan Chow on Flickr. The Evolution of James Bond, a limited edition of 250 Giclée Print. All six Bond’s lined in a row, the second from left is George Lazenby who turned down a seven-movie deal because his agent believed that the role would be seen as archaic in the liberated 1970s. All prints on 100% Cotton Matte Archival 315gsm paper. A3+ (13″x19″). are signed and cost £250. Very nice indeed Miss Moneypenny. I’ve just returned from London where I saw the thoroughly excellent Modern British Posters exhibition at Central St Martin College of Art and Design in Holborn. It’s a fairly compact exhibition pulled from the private collection of Paul Rennie (there’s a nice gallery here), one of the tutors at the famous art college. The exhibition covers the period around the second world war and concentrates on the heavy use of lithography, which dominated commercial art much longer in Britain than it did in the rest of Europe. There’s also a bit more humor in the posters when compared with contemporary material in the rest of Europe and some wonderfully sanctimonious war time propoganda. I recently came across a new site called FFFFound.com. It’s an image sharing site that allows its members (its a closed beta list) to upload images that they find on the web. 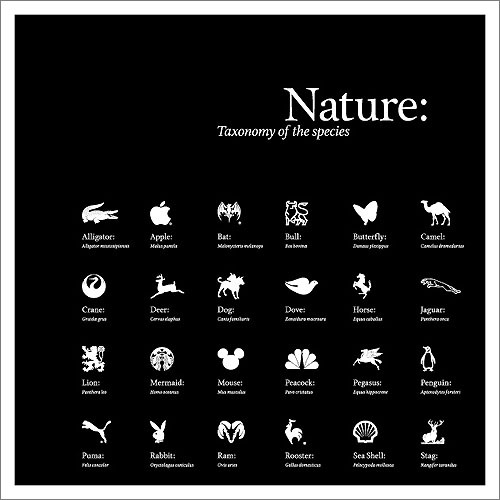 This work, a witty taxonomy of animals and mascots used as the logos for various global corporations, is by the US graphic designer Corey Holms, who is most famous for designing the logo for the Sopranos. If you like this sort of thing, then its also worth looking at another new Mexican site called Typeish which showcases an edited selection of fashion, photography, art installations and graphic design. I came across this smart looking poster shop within three of four clicks. Very interesting. Thanks for sharing these links.